With increasing holiday traffic and decreasing gas prices, police are urging drivers to be cautious while traveling the roads. 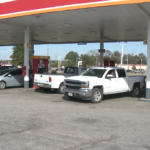 Gas prices across Alabama are averaging $2.35 per gallon. With families going to spend Thanksgiving with family and friends, police departments have a busy week ahead. “Well, we will have additional units out patrolling 231 and patrolling the city of Troy,” Captain of Patrol for Troy Police Department Danny Barron said. Barron says he its important for drivers to make sure passengers are obeying all traffic laws. Police patrol units will be paying close attention. “They’ll be out looking for aggressive drivers; looking for speeders; trying to slow them down, and make sure everyone on the roadway is safe,” Barron said. Simple tips, like wearing seatbelts and avoid speeding, can help keep everyone safe. “As always, we ask every one to buckle up. That has been shown to save lives,” Barron said. The Alabama Law Enforcement Agency says more drivers on the highways could mean an increase of accidents. “When you put a lot of people on the highway, then obviously and unfortunately, you have more violations. You have more people driving distracted, you have more people driving impaired,” ALEA Corporal Jess Thornton said. Putting down cell phones and being aware of what is going on around you could result in keeping your family safe. “Be 100% focused on that task of driving. There’s going to be a lot of congestion on the roadways that they’re not used to,” Thornton said. Barron says the police department will do its job to help ensure everyone spends Thanksgiving with their loved ones. “We want everybody to enjoy the holidays, get to their location safely, and be able to enjoy spending time with their family and friends during the thanksgiving holiday,” Barron said. According to the gasoline technology company Gasbuddy, gasoline prices in Alabama fallen 6.6 per gallon in the last week. AAA forecasts 54.3 million Americans will travel 50 miles or more for Thanksgiving. That number is the most since 2005.